By Brooke Holland, Noozhawk Staff Writer | @NoozhawkNews | November 22, 2016 | 5:28 p.m.
A four-story-tall Douglas fir tree is a traditional part of Santa Barbara’s holiday celebration, mounted near the Arlington Theatre and covered in lights. The towering tree was installed in the middle of State Street just north of the Victoria Street intersection Tuesday morning. At 45-feet tall, this Douglas fir traveled more than 280 miles from Shaver Lake, California. Southern California Edison donated the tree as part of its annual reforestation process. 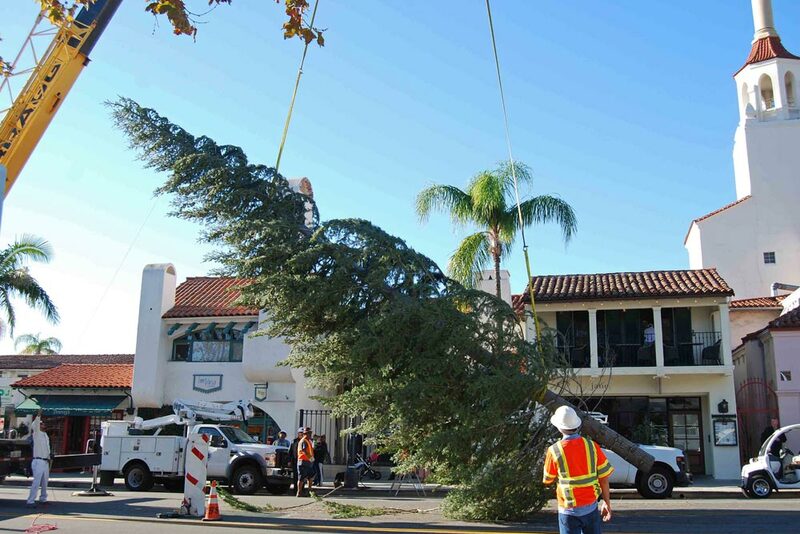 LaBrie also thanked crews from the Santa Barbara’s Public Works Department for the tree’s installation. Crews were trimming the branches and working throughout the morning, placing lights and a tree topper that makes up this structure. “This is all about Santa Barbara and having fun,” said Facilities and Energy Manager Jim Dewey. Onlookers are going to have to wait a week until this holiday attraction is lit up with lights. For people planning to have a picture taken with this tree, it comes to life at 6:30 p.m., Dec. 2 during the 64th Annual Downtown Santa Barbara Holiday Parade. The holiday prince and fairy will light up the tree at the beginning of the parade, and Co-Grand Marshals Cody and Caleb Walker will lead the event. This year’s theme, Holiday Under the Sea, will begin at State at Sola streets and travel south to Cota Street. Consumer Fire Products, Inc., delivered the tree and the business is the featured sponsor of the nighttime celebration. Downtown Santa Barbara Executive Director Maggie Campbell said more than 65,000 spectators are expected to line the street to view the holiday parade. “It’s one of the biggest free events on the Santa Barbara County South Coast,” Campbell said. In celebration of the holiday season, Downtown Santa Barbara, in partnership with Consumer Fire Products and Unity Shoppe, encourages businesses to participate in a holiday toy drive. All donations will be gifted to nearly 9,000 children from low-income families through the Unity Shoppe. To get more information about the toy drive, contact the Unity Shoppe spokeswoman Pat Hitchcock at pat@unityshoppe.org, or call 805.979.9511. Click here to watch the tree installation!